After you've been out walking, when the chilly night air is in everyone's bones, nothing's better than coming in out of the cold for a mug of vin chaud. Wouldn't you agree? Put on the carols, shuffle off their coats, have some candles or a fire to add points of warmth and light, and hand everyone a mug to warm their hands and hearts. The zest is only the colored part from the skin, and it contains the essential citrus oils. Wash the orange and lemon thoroughly, and then use a sharp klnife to remove the zest, recuperating as little of the white rind as possible. Mix all of the ingeredients into a pot and bring slowly to a simmer. Do not boil, but simmer slowly for 10 to 15 minutes. Serve hot, filtering it through a mesh sieve. If it's really cold outside, you can add a thimble or two of rum to each mug just before serving. I bet your candles didn't blow out either! My roomate's friend teased me that I wasn't really Lyonnaise because I used the wrong kind of glass to hold them. And they all blew out. But we did get to watch part of a light parade/spectacle on the Cours Gambetta from our candle-free balcony. Sigh. Maybe next year. 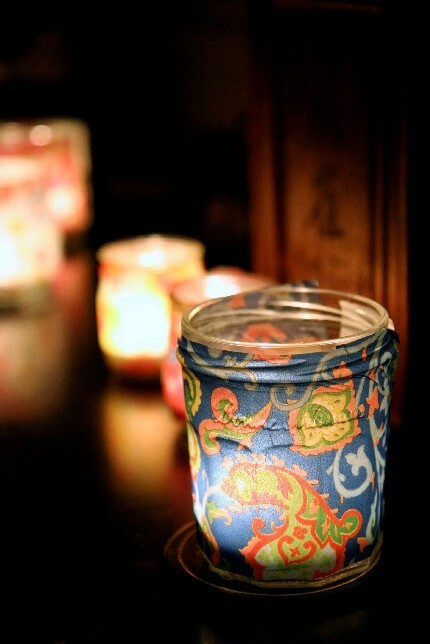 What a great idea for candles! And mulled wine. Maybe next year we'll get to Lyon to see the festival. We were a bit late thinking about it this year! I tried to make mulled wine the other night that was just...not that good. It was so bitter! Now I see it's because I forgot to add sugar. Duh. Gina Louise, you'll get the hang of it. When we lived on Cours Lafayette, ours blew out too. Looking at the light show from a balcony sounds like lots of fun. Katie, maybe next year! Although the show is always wonderful on the 8th, the crowds were a bit more managable (less human traffic jams) on the day after. You can keep that in mind for next year. Thanks Mimi, for your kind comment. Rebekka, yes, the sugar is a must for vin chaud. If you forget it, you can always add it at the end!